... will create the directories Documents, Pictures, Music, and Video. How to extract: Download the ZIP package and extract to a folder of your choice. Launch Text2Folders.exe. Fixed: Trailing tabs caused folder creation failures. @granny Are you sure FreeCommander can do this? I know it can create nested folders separated with a slash, but how can it create peer folders? 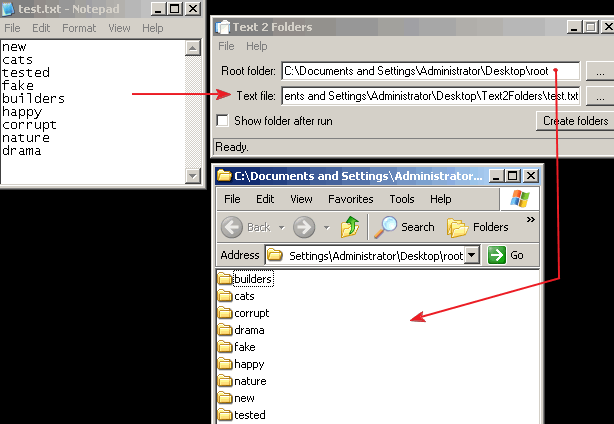 FreeCommander XE supports | to separate folders like TotalCommander, but plain FreeCommander doesn't. 1. search for desired file search app (usually, regex in filelocator lite). 2. select filenames in results. 3. "export" those filenames to clipboard. and manual edits to create batch commands. I know, but that’s several steps more (open editor, prefix, close editor, rename file, run file). This program is for the lazy and/or the none-too-savvy, not for the experienced user. Notepad2 can be used to prefix lines with an "MD"
FreeCommander can do this, but if you aren't lucky enough to use a file manager with the built-in feature, this little app is the next-best thing. Such a simple thing it seems unnecessary but then I went looking for a program that does something similar and couldn't find one.